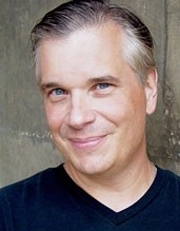 A father, actor, teacher and voice-over artist, Robert Pavlovich has appeared on stage in over 60 Regional, New Orleans, and Cincinnati productions. Favorites include: Adding Machine: A Musical, Eurydice, The Pillowman, Dirty Rotten Scoundrels, Glengarry Glen Ross, The Drowsy Chaperone, Search & Destroy and Of Mice and Men. He has appeared in motion pictures with Nicolas Cage, Julia Roberts, Jean-Claude van Damme, Craig T Nelson, Malcolm MacDowell and others in films like Bad Liutenant: PoCNO, Emulsion, Pelican Brief, Meth: The Movie, Cat People, Living in Technicolor, Hard Target, The Big Easy-series and The Fire Next Time, as well as Ohio Independent and CCM E-Media films. In an earlier life, he was a reporter/anchor for the UPI Radio Network (NYC and DC) and WWL News Radio. At WWL he won awards for reporting including recognition from the AP and UPI, the Press Club of New Orleans and Sigma Delta Chi (Green Eyeshade Award). His work took him from covering the Olympics and Presidential campaigns/conventions to the indictment of Governors. Pavlovich was a Producer/Director as well as Television Production Manager for Cox Communications in New Orleans where he was responsible for creating original programming, commercials, and image material for air. During this time, he won awards for commercial production (Grand Prize for Outstanding Achievement in Creative Cable TV Commercial Production) and for public affairs/issue programming (Dangerous Bonds: Gangs in New Orleans). Pavlovich has taught Acting at Loyola University of the South and the New Orleans Center for Creative Arts. As part of the CCM faculty, he teaches Theatre History, Acting for Camera, and Theatre In Your Life. Students have nominated him for a Glover Award, recognizing his commitment to quality education. He has been a proud member of SAG-AFTRA since 1983 and of Actor's Equity since 1998 having served on the Board and Committees of both Unions. Pavlovich is proudest of his sons, Robert Jr, Brett and Jason, and of his partner, friend and wife, Diane Lala. 1999 to To Present, University of Cincinnati College-Conservatory of Music.